Mascara tips — Free Makeup Samples and Weekly Tips — from Makeup Chick! 1. Clean, exfoliate, and tone first thing to start the day right. There are great products that even contain a hint of citrus to help energize you in the mornings. Cleansing and exfoliating can be done with one product; just be gentle and don’t scrub too hard. Follow up with a gentle toner. Witch hazel is still a classic toner that won’t dry and isn’t overly harsh. 2. Hydrate and protect before applying any make-up. Age-fighting and age-defying moisturizers are available with sun protection and a slight tent. These are great timesavers and good for the skin. If you’re not old enough for any “age” related products, be sure to at least include an SPF 15 moisturizer in your routine. 3. Bronzing mineral powders and soft blushes. Apply the bronzer all over and then give the cheeks a dab of color just out from the apple of the cheek and blend well. Soft peaches and pinks work best for everyday. 4. Eyes only need a little shimmer in light creams and golds for the lid then accent with a taupe or light brown in the crease and outer lid. Blend gently. 5. Brown and taupes are the most natural looks for eyeliners and mascaras and can be used on the tops and bottoms to create definition without drama. 6.Finish off the look with soft pink lipsticks or balms. Avoid heavy glosses or products with a lot of shimmer to keep the look professional. Some people just seem to have a knack for flawless makeup application. It doesn’t seem to matter where they are or how they apply it, the makeup always looks natural and beautiful. Then there are those of us who could spend hours and hours trying, but never get it quite right. Whether you’re a makeup whiz or a makeup ditz, try some of these foolproof methods for a successful makeup application. *Start with a smooth and natural canvas by applying a lightweight liquid or mousse foundation, then blend it with a quality brush for a much more natural look. The brush will remove any streaks and help create a smoother finish. *Always BLEND with a good makeup brush. Whether it is foundation, powder, blush or eye shadow, blend using small circles until you think it’s natural looking and blended. Then blend just a little bit more. *Without a steady hand, eyeliner can get a bit dangerous. If you want to line the eyes, try using your mascara at the very, very base of the lashes and giving it a little extra wiggle with the application. *Lips can be lined to help create a shape and look you want, but no one really wants to look like cartoon with the outline of lips. Never use a sharply sharpened liner; always dull the tip for a softer and more natural line. Fill in the outlined area lightly with the same liner, top with a lipstick or gloss, dust with face powder and then apply a second coat of lipstick or gloss for a flawless and stay-put finish. *Never use your fingers for applying makeup. Those oily digits will break down the makeup faster, smear and smudge without warning, and leave streaks that will take longer to blend. There are a myriad of choices for inexpensive brushes and utensils out there that will make a big difference in your look. Clumps Clumps Go Away – Mascara! The first step in mascara application is to make sure there are no clumps on the wand before you even begin applying the product. 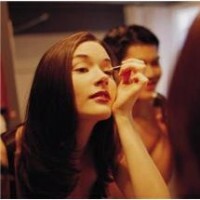 Use a tissue to remove the excess mascara from the wand if necessary. Never, never pump the wand in and out of the tube. Adding air to your mascara will cause it to dry out faster and clump easier. To keep lashed from clumping, use a clean mascara wand after you’ve applied your mascara to take away the excess product and separate the lashes more completely. The best way to do this is to apply the mascara to the front of the lashes with your eyes open, then close your eyes and use the clean wand to go over the back of the lashes. Using a lash comb is also an option for removing clumps. Follow the same procedure, but use a lash comb instead of a clean wand. Always be sure to apply mascara at the base of the lashes first and then pull through to the tips. Keep the wand going in a side to side motion (the shimmy) as you apply the product. If applying a second coat, which should only be done for special occasions or in the evenings, do it immediately after, the first coat is applied. Going over a dry coat of mascara will lead to more clumps and flaking. No one can carry clumps well, so be sure to take a few extra seconds for the proper, clump-free application. We strive for those perfectly plump eyelashes that we can bat at the next cutie to walk by, but how do we get them? And how in the world are we supposed to sort through the myriad of choices when it comes to quality products? It is completely possible to find quality mascara for a reasonable price at your local drugstore. Avoid off brands where the price seems to be too good to be true…these will clump and make a mess. Once a brand has been chosen, start thinking about the different formula options and what your personal needs are. Options such as lengthening, thickening, and waterproof are the most popular. For contact lens wearers, waterproof seems to be the best option. If you can forgo the waterproof option, try mixing and matching mascaras. Start with a swipe of lengthening and then top it off with a coat of thickening. Along with formula options, there are now color and shimmer options. Although a shimmering mascara can be subtle and brighten the eyes, avoid glitter-rich products unless you are in a fashion shoot or off to a Halloween party. Soft blacks, charcoals, and black/browns can work for most people for either day or night. If you’re looking to mix things up, try a color that will make your eyes really stand out like plum for blue eyes and purple for green or brown eyes. After the product has been selected, proper application is crucial. Use the hairdryer to heat up an eyelash curler for better results. Then use the shimmy method of application. Shimmy the wand from side to side as you slowly drag it the length of the lashes. This will help to separate the lashes and avoid clumps. Most of us can skip applying mascara to the bottom lashes, but if you need the illusion of wider eyes, a light touch of the wand to the bottom lashes is fine. Some people have it and some do not…hair with natural volume that is. If you are among those who have been blessed with voluminous hair, congratulations! On the other hand, if you haven’t and still crave volume, don’t despair. It can still be achieved! In addition to using volumizing shampoos and conditioners, there are also supplements that can be taken to help hair. B-vitamins, zinc, and iron can help boost hair volume and growth and are the key ingredients that help prenatal vitamins seem to work so well. During the styling process, creating the illusion of volume is also possible. Try blow drying hair while bent over at the waist and flipping hair upside down. Applying hairspray while flipped over this way will also help to volumize hair, but be sure to avoid putting a stiff layer of laquer on the top of the hair as it will weight it down and reduce the voluminous look. Shades of black eye shadows work well on all eye colors, are a sure-bet, smudge on an intense streak of one of these along your lash lines. Out of eye makeup remover or just don’t own any? Put some facial moisturizer on a cotton ball and wipe across eyes. This works just like eye makeup remover! To enhance your lashes, apply two to three coats of mascara. For a more dramatic look, apply a couple of coats to both the top and the bottom lashes. To open up your eyes on those less than perky days, use a silvery eye shadow at the brow bone and the inner eye corner. To make those eyes pop, choose shades of complementary color eye shadows (the ones that are opposite your eye color on the color wheel). No matter what your eye color, skin tone can make a difference in making your eyes stand out. Whatever you decide to do to decorate your eyes, be sure to take good care of them by keeping them clean, moisturizing with a light eye cream, and resting them enough. Young and Simple. Who wouldn’t like to look a little younger? To create the illusion of youth for your eyes, go with a much simpler eye make-up approach. Start by lining the upper and lower lashes a bit heavier than normal and then smudge to create a soft, shadowy effect. Keep the eye shadow simple by using a highlight color with a little shimmer to it like gold or silver. Only apply the eye shadow to the middle section of the lids and then spend some time blending the soft color outward. To finish off this youthful look, apply a couple of coats of lengthening mascara to the top lashes only. Experiment with some of the new shimmery products on the market today like mascara with “diamond” dust or shimmering effects. To open the eyes up a bit more and enhance the youthful, doe-eyed look, apply a small amount of white or silver eye shadow to the innermost corners of the eye and blend slightly.